Kole’s Nana is definitely a little bit magic: at her house, the Tooth Fairy always visits, Santa eats all the cookies, and the Easter Bunny leaves huge eggs. So when Nana cooks her special green-dyed, dinosaur-shaped pancakes for breakfast, Kole knows something amazing will happen. 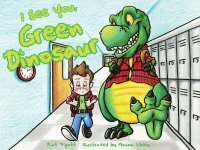 No sooner does Nana step out of the room than Kole hears a ferocious roar from his plate and his green dinosaur pancakes become huge green dinosaurs! 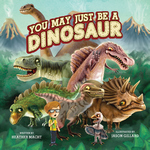 With hilarious pictures by debut teen illustrator Mason Sibley and a recipe for making your very own green dinosaur pancakes (magical transformations not guaranteed), this prehistoric, prandial adventure is a tasty part of a complete breakfast. 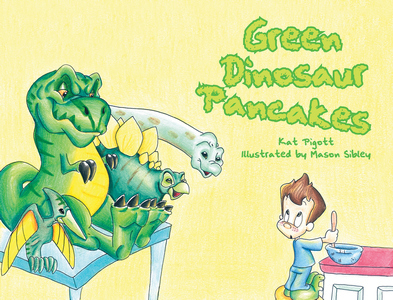 Kat Pigott’s lifelong love of cooking and food began when she was young and her father made green dinosaur pancakes for her and her sister. Pigott has worked as a chef, catering director, and food pantry director. Gifted teenaged illustrator Mason Sibley has been drawing since he was three. Recognized by several leading artists and animators as an emerging talent, Sibley has received numerous academic and artistic honors.